“Building from the successes of 2017, Bank of Southern California had a strong start to 2018. Our loans and deposits grew 17% and 16%, respectively, compared to the first quarter of 2017, while net interest income grew 24%. 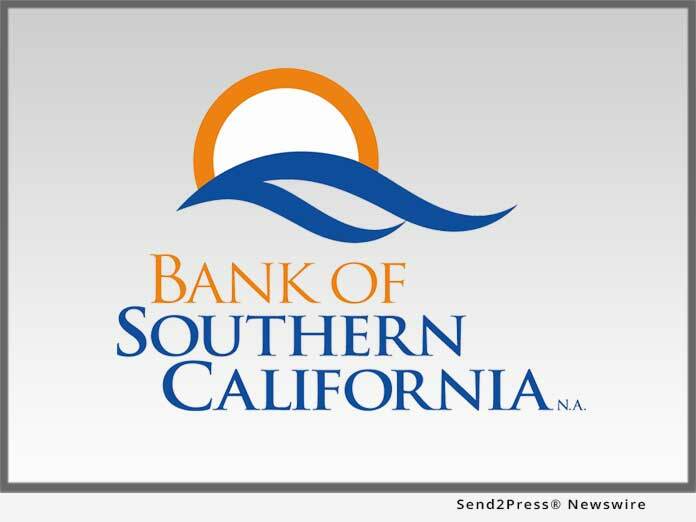 In the first quarter, the Bank was also recognized as a top SBA 7(a) lender by the San Diego District Office of the Small Business Loan Administration and was awarded a Super Premier Performing Bank status by The Findley Reports,” commented Nathan Rogge, President and CEO of Bank of Southern California. Total assets at March 31, 2018, were $522 million, up 9% from $480 million at December 31, 2017, and up 21% from $430 million at March 31, 2017. Total loans increased to $409 million at March 31, 2018, compared to $399 million and $349 million at December 31, 2017, and March 31, 2017, respectively, while total deposits were $444 million at March 31, 2018, compared to $407 million at December 31, 2017, and $383 million at March 31, 2017. 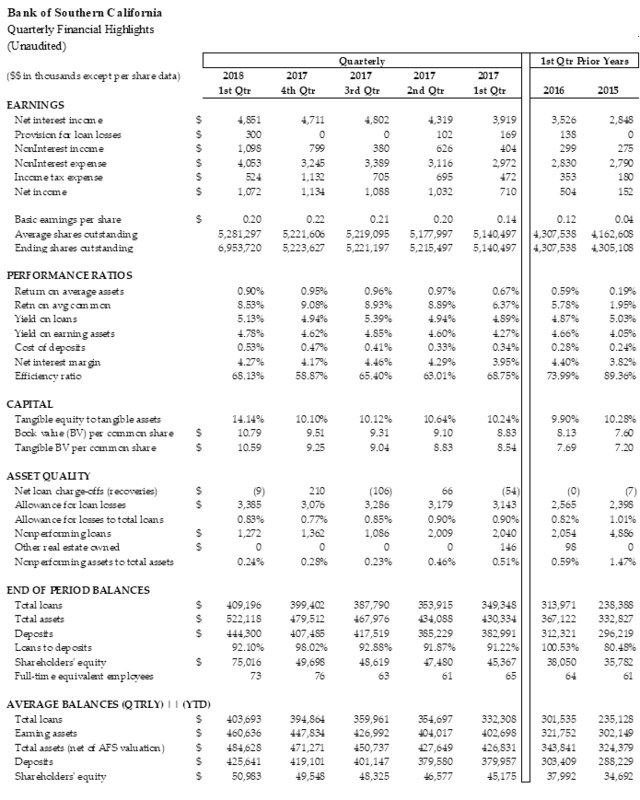 “I am delighted that we continued to organically grow our loan and deposit portfolios in San Diego County, the Coachella Valley, and Orange County in the first quarter, when much of our energy was focused on planning for the acquisition of Americas United Bank (AUNB), as well as successfully completing a $26 million capital offering,” concluded Rogge. A growing community bank established in 2001, Bank of Southern California, N.A., with headquarters in San Diego, Calif., is locally owned and managed, and offers a range of financial products and services to individuals, professionals, and small-to-mid sized businesses. The Bank’s solution-driven, relationship-based approach to banking provides accessibility to decision makers and enhances value through strong partnerships with its clients. The Bank currently operates seven branches in San Diego and the Coachella Valley in Riverside County, and a production office in Orange, Calif..